← Father’s Day Love and a fun update! So most bloggers like to do Fashion Friday, but since I have a slight (okay MAJOR) obsession with Food Trucks I’m going to start a weekly Food Truck Friday. The Food Truck world in Vegas has gotten big recently. There is a monthly food truck festival called Vegas Streats (check out their website here). It is a lot of FUN! 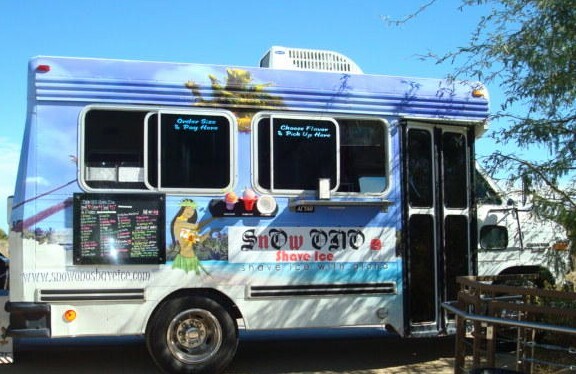 This week I’m going to start with my FAV food truck ladies of Snow Ono Shave Ice! They do authentic Hawaiian Shave Ice. Now you’re probably thinking what’s so great about a snow cone? WELL first of all it is NOTHING like a snow cone, except for it’s made from ice and it has flavoring. The consistency is fluffy and AMAZING! One of my fav flavor combinations: tigers blood (my fav flavor), mango and pineapple. They drive around in the cutest old school bus that is painted with a Hawaiian beach theme and they are usually out every day but Monday and Thursday, they save those days for ohana time 🙂 I literally go 3 times a week. Luckily they are near my house a decent amount of time so I don’t have to go too far for my favorite treat! You can get their weekly schedule here! 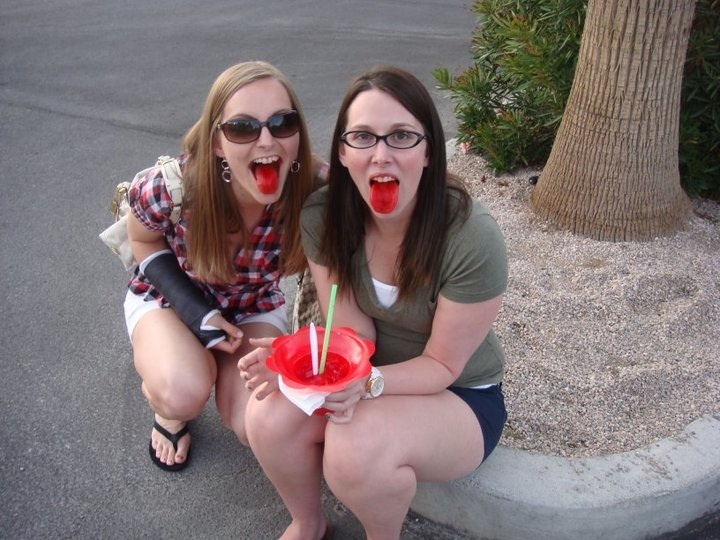 My first Snow Ono experience was at the May Vegas Streats, it was FREEZING (at least for me, I’m a Florida girl) but I really wanted to try their Shave Ice. 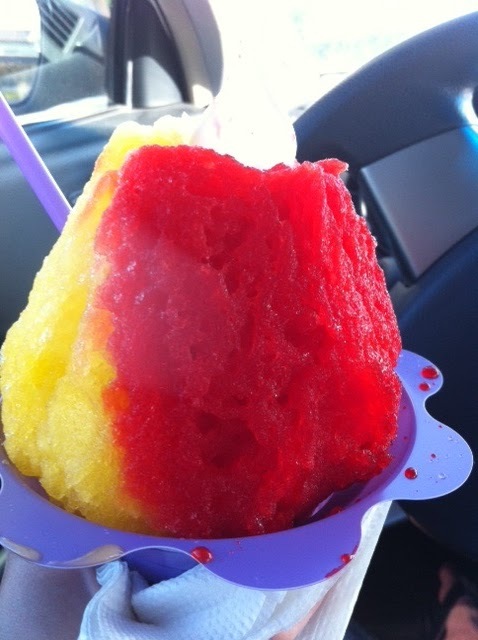 I had been to Hawaii over the winter holidays so I had tried shave ice there and really loved it. The ladies are super sweet, they truly love what they do and they are a huge part of why I go back over and over again! Enjoying my shave ice! 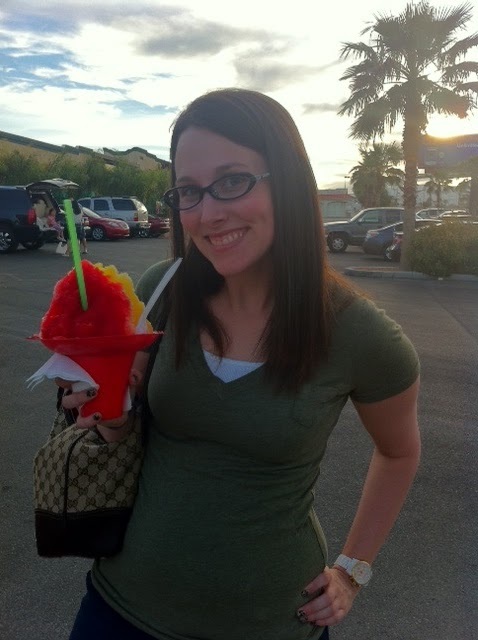 I got a large that day (shave ice for dinner is my FAV). Follow them on twitter and facebook so you get up to date locations and times. Since they’re dealing with trucks and buses they can have mechanical issues and not make it out. Bring your friends! The only way these food trucks survive is getting business, if you love a food truck introduce your friends to it so the business with thrive! Try new things! A lot of the food trucks have different and unique styles of food. I’ve tried things I never thought I would eat, and ENJOYED it! Bring your appetite!! They have so many good options so be prepared to EAT! Do you any of you have favorite food trucks in your town? ?